When it comes to finding the best solution for your teeth, no one will work harder than we will here at Edge Dental. We can find the best possible ways to salvage and utilize as much of your original tooth as possible, whether there is decay or damage. One such way we do just that is with the use of inlays and inlays, which help us to secure and save the integrity of a tooth that is too damaged for a filling, but not damaged enough for a crown. Inlays and onlays are very hard and durable substances that allow us to keep what remaining healthy tooth you have in place when repairing an issue. Some teeth have small amounts of decay, and others have a lot, rendering the tooth nearly useless. So, what happens if it falls somewhere in the middle? Generally, at that point, the damage is too significant for a filling to be particularly effective. By the same token, a crown or extraction is too drastic of a change to be warranted. In cases like this, an inlay or onlay can be perfect. This material cover can last 30 years or more, offering a long-term solution. These options can also strengthen your teeth up to 75%! Other options, like metal fillings, can do the opposite. Finally, this option can eliminate further work being needed down the line, as it can prevent further damage or decay with proper care. While the two do the same jobs essentially, an inlay lies within the cusps of your teeth or the edges. An onlay, though, extends over the edges, covering a bit more of your tooth. 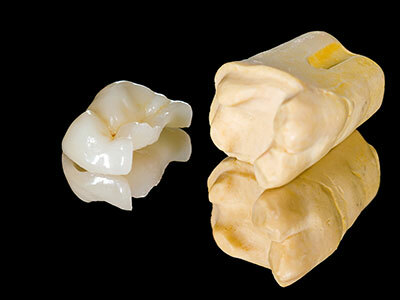 Both options are used to replace old fillings, but an inlay is most similar to a filling. Like many other restorative procedures like implants or crowns, you have to make two separate appointments. In the first, you will be given an anesthetic, and we will clean out any decay you have and repair any damage as well as we can. Then, we will prepare your tooth for the inlay/onlay before taking an impression with which we will make you a custom piece to fit your tooth and bite pattern. At the second appointment, your custom piece will be done, and the temporary piece we made will be removed. Once it fits perfectly and we have made any necessary last minute adjustments, it will be cemented to your tooth, and you will be all set again. Edge Dental will help you feel your best in no time flat. Knowing that you have these types of issues can cause much stress, let alone pain if it gets further damaged. It is an easy fix, though, and our expert team will get you back to your old self with a comfortable and radiant smile quickly and safely.